In plain English, the legislature must pass a redistricting bill in the first legislative session after the federal census. Once it does so, the general rule is that a valid apportionment law may not be replaced with a law creating new districts until the time of the next census. Of course, if the legislature’s redistricting legislation violates the state or federal constitutions, it is not valid and the legislature must pass a new apportionment bill. The three judge panel in the Baldus case may rule the maps invalid, but it suggested that the legislature might consider passing a new redistricting plan rather than proceed to trial. The Republicans say that they lack the power to pass a new plan, relying on the case of Smith v. Zimmerman, 266 Wis. 307 (1954). Bear with me as I recount the convoluted history behind this case. In 1951, the legislature passed a statute creating new legislative districts in Wisconsin. However, under the terms of the law, the effectiveness of the new districts was contingent upon the result of a referendum to be held in 1952. If the referendum approved the districts, then the new districts would apply for the first time to the 1954 elections. The 1951 law, which created these new districts but delayed their implementation, was found to be constitutional in Broughton v. Zimmerman, 261 Wis. 398 (1952). Meanwhile, in 1953 the legislature attempted to amend the Wisconsin Constitution in order to change the manner in which legislative districts were drawn, and it passed a new redistricting law in order to implement these constitutional changes. The Wisconsin Supreme Court held that this attempted constitutional amendment was invalid, due to the failure to follow the appropriate procedures for submission and ratification of amendments. Thomson v. Zimmerman, 264 Wis. 644 (1953). Therefore, in Smith v. Zimmerman, the question before the Wisconsin Supreme Court was “which redistricting law was in effect?” Was it the original 1951 statute, or was it the 1953 statute that had been passed following the botched constitutional amendment? The Wisconsin Supreme Court held that the 1951 law had exhausted the legislature’s power to create new districts, because it was a valid enactment and because there was no constitutional challenge to the law. Therefore, the legislature could not pass a new law in 1953 creating different districts. In the absence of a successful attack upon its constitutionality (not attempted here), it was a reapportionment, directed by the constitution to be done once and only once following each federal census, which passed beyond the legislature’s power of revision at the date of the referendum at the very latest. It is not necessary to decide now whether it so passed at an earlier date. Strictly speaking, the Court held that if the legislature possessed any power to revise the 1951 apportionment law, that power to revise the law ended when the referendum was held in 1952. The Court expressly declined to decide whether the legislature possessed any power to revise the law between the time that it passed the 1951 statute and the time of the 1952 referendum. The Republican Party has argued, in the current lawsuit in federal court, that because it passed the redistricting bill at issue in the case the legislature now lacks any power to revise the law unless directed to do so by a court. The judge disagrees with this interpretation of Smith v. Zimmerman, and seems to assume that the legislature can “re-redistrict” until the new maps come into effect (or at least until the end of the current legislative session). It is certainly possible to read the precedent as permitting revisions of the law for a brief period of time after its passage, but not once we are well into the ten year period between censuses. There are two countervailing interests at play. On the one hand, we do not want to encourage legislatures to draw new voting maps every year or every other year, just because the party in control of the legislature sees a partisan advantage in doing so. Limiting the redistricting process to a once-in-ten year event avoids this problem. On the other hand, if the legislature creates new maps, but obvious defects or problems with the new districts become apparent shortly after passage, there seems no good reason to require the legislature to wait a full ten years before instituting a fix. Recognizing that the legislature retains the power to revise the new maps at least until the end of the current session would be a more satisfactory way to deal with the “re-redistricting” problem than simply adopting a strict interpretation of the Wisconsin Constitution. In instances where the original law is flawed in some way, and the flaw becomes apparent shortly after passage of the law, insisting upon a strict interpretation of the state constitution would only serve to keep the flawed plan in place or else force the courts to draw new maps. Faced with this choice, a federal judge might prefer that the legislature perform the political act of drawing voting maps, while simultaneously adopting an interpretation of the constitution that avoids inflicting a flawed redistricting plan on the voters for the next ten years. For example, consider a state like Indiana, which textually commits the power to redistrict only to “[t]he General Assembly elected during the year in which a federal decennial census is taken.” Under a strict reading of the state constitution, if a legislative plan were invalidated in 2014, the legislature would not be empowered to erect a new plan in its place. Most courts are uneasy with the ramifications of such a rule, which would force the court to draw district lines effective at least until the next census. Instead, courts generally prefer to commit difficult redistricting decisions back to the political branches. For federal courts, this hesitation doubtless flows in part from the Elections Clause, which expressly commits the power to regulate federal elections to the “Legislature” of each state when not otherwise preempted by Congress. For state courts, the preference likely reflects the conception that the act of redistricting is inherently political, and not well-suited to the judicial role. Such considerations could, in turn, affect how courts construe the timing provisions of their state constitutions. A court wary of its own authority to draw district lines–or loathe to engage in the political calculations required to do so–will be more apt to find ways to return the responsibility to a legislature or commission, construing the state constitution flexibly rather than strictly in order to do so. It could, for example, determine that a constitutional delegation of redistricting authority enabling a particular body to draw lines at particular times merely establishes a continuing duty for that body to draw lines until it gets the answer right. In other words, the court might decide that a legislature’s drawing appropriate lines in the invalid time period is better than drawing invalid lines in the appropriate time period–and that any legislative action is preferable to court-drawn lines for the duration of the decade. In this regard, courts should tread carefully, and should not allow their assessment of their own institutional limitations to trump the given constitutional structure. There are good reasons why constitutional framers might have wanted legislatures to draw district lines only immediately after a census. For example, districts drawn in the middle of the decade must rely either on outdated census population figures or less precise updated estimates, while those drawn immediately after a census can be tailored to the most accurate population counts available. In addition, mid-decade redistricting allows political parties to choose to redistrict whenever they manage to secure unitary control of state government–and thereby maximize partisan gain–while districting tied to the census introduces at least an element of political chance. The nature of ambiguous constitutional text will also govern courts’ leeway. Some ambiguous provisions will be more amenable to flexible interpretations than others. In the event of such interpretations, courts should carefully cabin their rulings. A loose construction of constitutional restrictions that effectively nullifies limiting text–for example, “at the first session after the federal census”–if not constrained to the off-cycle replacement of an invalid plan, might facilitate repeated intra-decade action by a redistricting body replacing one valid plan with another. In the event that courts are predisposed to interpret constitutional provisions to give themselves an escape route from the messy business of redistricting, they should take care lest the underlying constitutional design of the timing provision be overturned entirely. Justin Levitt and Michael McDonald, The Law of Politics: The Role of Law in Advancing Democracy: Taking the “Re” out of Redistricting: State Constitutional Provisions on Redistricting Timing, 95 GEO. L. J. 1247, 1268-1270 (2007). 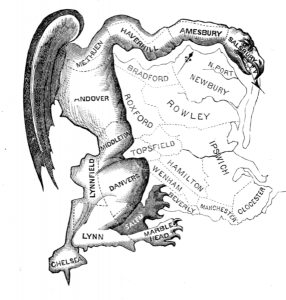 The issues raised by “re-redistricting” cases are complicated and unsettled. The case of Smith v. Zimmerman does not stand for the proposition that the legislature loses all power to revise legislative districts for the next ten years the moment that it passes legislation creating new voting maps. However, the legislature is not free to pass multiple re-districting laws at its leisure within the ten year period between censuses. Levitt and McDonald are correct that the courts should tread carefully here. Judges should avoid construing the legislative power to revise flawed voting districts either too narrowly or too broadly. Ed, are you comfortable with a federal court deciding this convoluted and unsettled question of state law on what is likely just a day or two of consideration of letter briefs? I could be mistaken, but it seems like this issue just came up in the past few days. However, I am not sure that the Smith v. Zimmerman case can be read to completely deprive the legislature of the authority to revise the maps in the present litigation. I struggle to read that opinion as standing for the strict rule that the Republicans say it stands for. If the three judge panel distinguishes the case, then there appears to be no need for them to reach the constitutional question. We are still in the first session after the census data became available. This is not a situation where two years have passed and the legislature decides to re-redistrict. Yeah, I haven’t formed an opinion yet on the merits of the question, but I was surprised by the panel reaching a holding on it. From a practical matter, I wonder how such an “any time in the first session” rule would mesh with recalls. Conceivably, you could have one party in control of both houses and the governorship after a census; they could redistrict; and then recalls could swap all three groups (after second-year recalls in the assembly) and enact a completely new redistrict map.